First Line: We cannot express the depths of our disappointment, Madeline. When her beloved husband dies in the trenches of World War I, Madeline Vaughn-Alwin takes the opportunity to leave her wealthy New York family and head to California. But when she stops in Santa Fe, New Mexico, she falls in love with the place and decides this is where she can concentrate on a career as an artist. She hires a local Native American family to help out around her new home, but when the father is found murdered in the alley in back of a speakeasy, the police brush it off as just another drunk dying. Maddie cares too much for the family to let that be the man's epitaph, so she does some investigating on her own with the help of a few friends. 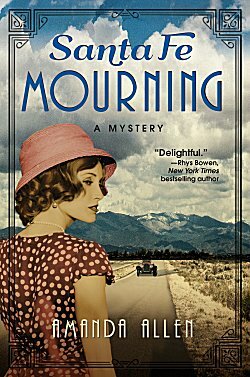 The major reason why I chose to read Santa Fe Mourning is its setting of Santa Fe, New Mexico in the 1920s, and in this respect, the book certainly does not disappoint. The landscape comes to life and so does the time period. In the 1920s, Santa Fe was a place where people with lung ailments went for cures-- and where ne'er-do-wells and rich families' "black sheep" went so they wouldn't be an embarrassment. We also get to learn about some of the real-life people who called the place home. All in all, I was given some happy researching to do about the area's history-- and I'm also planning a return trip. The mystery surrounding the man's death is solid, although I did find whodunit rather easy to deduce. For me, the major downfall of the book is in its characters. Maddie is a strong main character, and her wealthy background does give her an advantage when trying to tease out some of the clues, but the rest of the cast is rather two-dimensional. I was most disappointed in Maddie's love interest-- a handsome British doctor who comes to work at an area hospital. The man has very little to say for himself. The two meet for dinner, but we're told more of what they spoke about than actually hearing their conversation. The doctor helps Maddie out in her investigation, but we don't hear it from him; once again we're told what he discovered. When a character is supposed to be so wonderful, I want to find out for myself, not be told secondhand, and I would imagine many readers feel the same way. So... I have a dilemma. Do I read the next book in the series because I love the setting and the time period so much? Or do I give it a miss because the characters are disappointing? I'm afraid the jury is still out. I'd have gone for that setting, too, Cathy. And I can see the appeal of the time period as well. But, if I'm being totally honest, there are so many good books to read, I don't think I'd persist with a series if I didn't really care about the characters. I have, and the deciding factor was that this really isn't a first book, merely a first book in a series. The author has written several other books under another name. Hmmm. Like the setting, but your review doesn't inspire me to read it. Too much to read.